Essentially comprising of a number of separate boilers working together, modular boilers can provide great power with great efficiency. This efficiency is achieved by sharing modulation across all modules, preventing the inefficiencies of on/off cycling by matching the output power to the thermal load of the system. Optimum efficiency and reliability are important considerations in the specification of plant for most buildings, but especially so in those with variable demand. Multiple modules also have the benefit of allowing for continuation of supply; in the unlikely event of one of the modules failing, the system will remain in operation. The range of modular boilers on the market is now very flexible. For example, Ideal Commercial boilers can supply Evomod which comprises of stackable modules each offering a 250kW output, making it a scalable commercial heating solution which can be increased to meet specifications of up to 1MW. 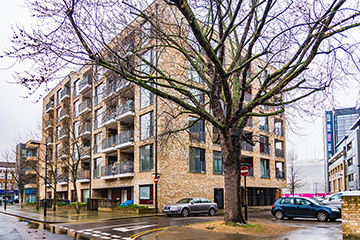 An example of how the modular boiler approach provides flexibility in installation as well as performance is Hitard Court in Southwark, London. When the capital plant boilers there had to be replaced quickly to ensure over 400 residents continued to have heating and hot water, heating specialists East West Connect took the modular approach. Built in 2012, Hitard Court is part of the first phase of the Aylesbury Estate regeneration. The building has a district heat network with boilers in the basement plant room generating hot water that is then pumped around the building and heat interface units provide hot water and heating to each apartment. East West Connect were called in when the original boilers failed, knowing that they had to provide a solution quickly to make sure hot water kept flowing. The choice of boiler depended on several factors. The primary need was a boiler solution with a high rate of modulation, as the demand from the residents varies widely through the day, and a high enough output to cope with peak times. There were practical considerations too; not only did the boiler chosen have to fit in the available space in the plant room, there were also stairs to negotiate to get into the plant room. Ross Carroll, Projects Director for East West Connect, decided on an Evomod 1MW boiler as the answer for Hitard Court as it met the requirements of the brief. Each module has a modulation rate of 5:1, meaning that four combined gives a 20:1 modulation rate. This in turn allows the boiler to modulate down to just 46.7kW from its high maximum output. Four separate modules were easy to transport into the plant room, and when bolted together, the boiler has a footprint of less than 2m2, fitting comfortable into the space available. Modular boilers are also equally at home in new build projects as they are in refurbishment and replacement installations. A world first in multi-faith education, the joint faith campus in Newton Mearns, Glasgow, was recently opened, replacing an existing Jewish school and providing additional primary school provision for the local Catholic community. This £18.2 million project boasts a shared amphitheatre and outdoor obstacle trails, as well as sports pitches, first-class ICT facilities, modern teaching spaces, an impressive library and state of the art science laboratories. The boilers for the building were required to provide a high output solution capable of delivering 1.5MW in an unusually small footprint. Two 3-module Evomod boilers, with stainless steel heat exchangers, each providing an output of 750kW, were installed. They use a combined flue header for all three modules of each boiler, complete with flow return pipework for quick installation. The school is already reaping the benefits of this approach. 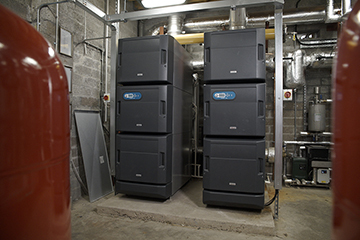 “Marmac Services has taken on one of the maintenance contracts within the school and we have been updated continually on the boilers’ energy efficiency. We have had only positive results”, explains McCall. Chris Caton is head of Commercial Product Management at Ideal Boilers.